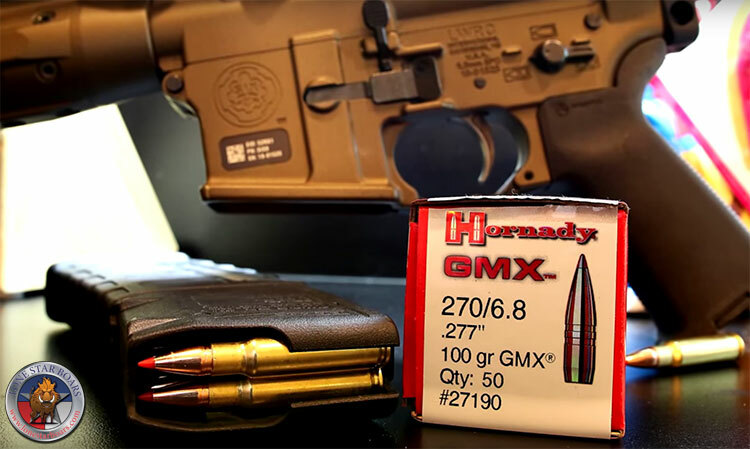 The Hornady 100 Grain GMX Bullet is out for Reloaders too! I received some of the brand new Hornady 6.8 spc 100gr GMX Full Boar ammunition from Hornady, with plans to test it’s performance on tough Texas wild hogs. 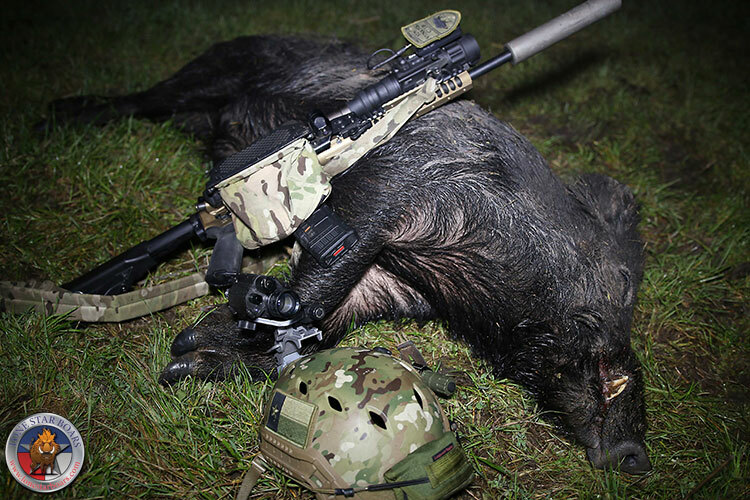 For this hunt I was shooting the LWRC Six8 Razorback AR15 rifle, topped with a Vortex Razor 1×6 and Armasight’s Apollo thermal clip on. I normally shoot the Hornady 120gr SST with great success, but was interested to see how this new 100 grain GMX bullet would stack up. These would be the first kills with this bullet, so as I headed out for the hunt, my anticipation of this bullet’s performance was high. I headed out while it was still daylight, so I could scout the ranch for recent activity. 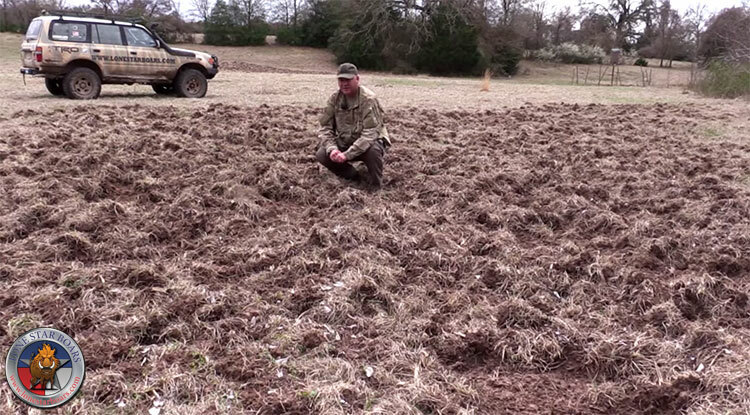 I found a hay pasture that the hogs were destroying (see video below for actual footage of the damage). It looked like an artillery barrage had hit the area, with not much ground left unturned. Once darkness fell, a thick fog rolled in rendering white light and night vision useless much past 50 yards. While approaching the pasture on foot, I could hear the squeals and grunts of the hogs fighting over whatever food they had rooted up. Taking position up on a small hill overlooking the pasture, the hogs were invisible in the fog. Fortunately, the thermal worked fine, cutting through the fog, making targeting easy. I picked out a hog that was broadside, and took the shot. The bullet hit, and he went down immediately. It was a hefty 200+ pound boar, with nice cutters. He was also the first recorded kill with the Hornady 100gr GMX bullet! After he fell, I started engaging the rest of the hogs, knocking down three more with the new GMX bullet. Even though some had less than optimal shot placement (shot while running straight away), the hogs were anchored for easy follow up shots. One of 7 Coyotes the Author Took with the 100 GR. GMX Bullet. 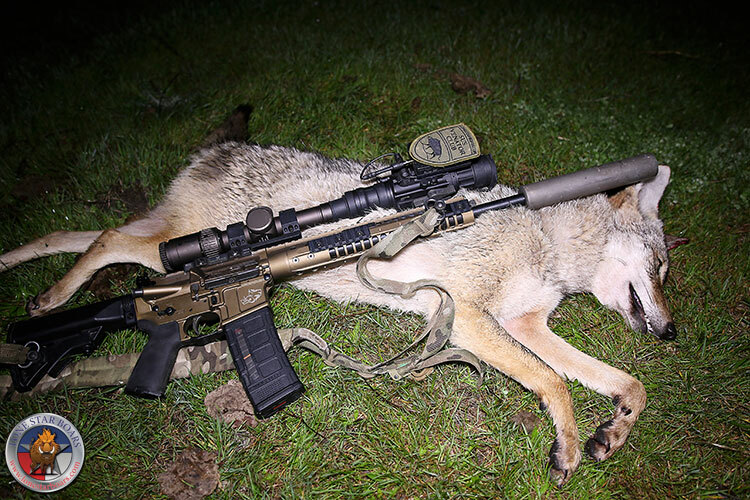 The hunt ended with eleven dead hogs and seven dead coyotes. They were taken at ranges that varied from 50 yards to 250 yards. Nothing I hit escaped, and most of the hogs went down (dead) instantly, while all of the coyotes went down with one hit. I am very pleased with the Hornady 100 Grain GMX bullet in the 6.8 SPC. It performed well, with great penetration, even through some of the hog’s thick shoulders, producing dime to penny size exit wounds. 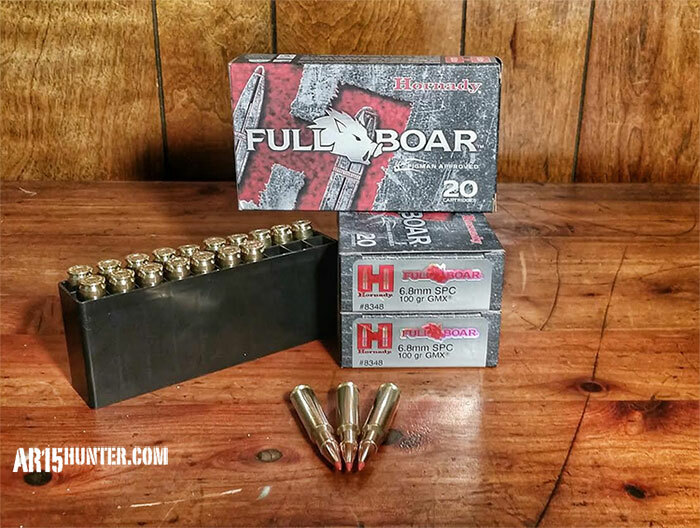 All in all, my first hunt with the Hornady 6.8SPC – 100 Grain GMX Full Boar ammo went very well, but you’ll know that once you watch the accompanying video!